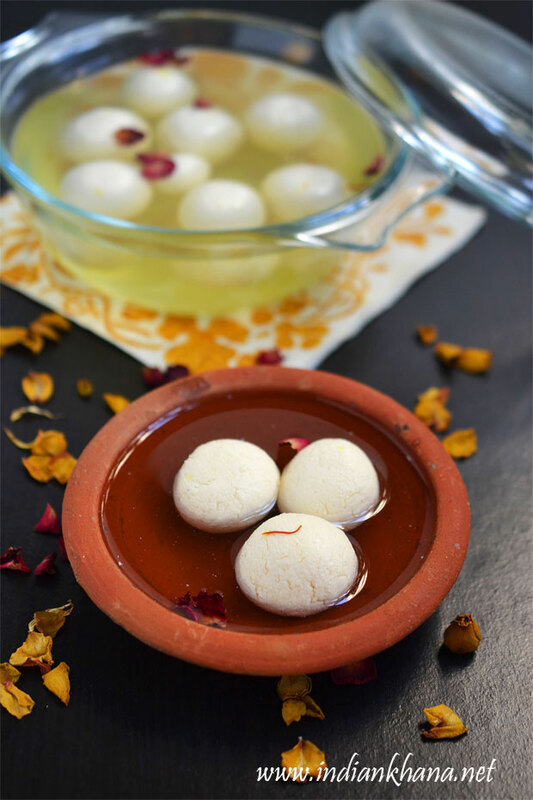 Rasgulla, or Roshogolla, Rosogolla as called by Bengali is wonderful bengali sweet recipe and which has to be the most famous bengali sweet, in fact popular Indian sweet too. Soft, spongy, melt in mouth rasullas are treat to eat and we can say it's healthy compare to lot of other Indian sweets as it's not deep fried and we can reduce sugar syrup a lot while eating. Rasgulla is wonderful sweet for any occasion, celebration of festivals. .
DH is great Bengali sweets fan his boarding school are surrounded by Bengali people so they used to get amazing bengali food and sweets even now in Raipur we know where the best sweets we can get the fresh rasgulla, sandesh, gursandesh and kalakand. I haven't seen such fresh, delicious kalakand anywhere else till now it's hardly sweet just pure milk - Yum. Today is our wedding anniversary so I thought I will share this easy, wonderful recipe and the sweet which he likes :) And also that this is no-fry, no-ghee and less sweet (as we none of drink the sugar syrup) it's makes wonderful sweet to celebrate our anniversary or in fact any occasion, festival like Diwali, Holi, Rakhi, party or get-together is good excuse to make these beautiful rasgulla. Making good rasgulla is a art which we can learn quite easily and even if not successful in 1st attempt after few trials we can get it right, so don't give up if your rasgulla doesn't turn up the way you expected it to be. Infact my 2 trials were not successful and I didn't try making rasgulla again for long time but then I decided to give a try again and got good result with some pointers to note which I have listed below in note section. The sugar syrup is white and not cream in color as shown in below picture, the underneath tissue golden reflection is making the syrup looks like that which I realized only when I started to edit the picture :( And of course if we add saffron syrup color changes a bit and I did added few strands of saffron for flavor. 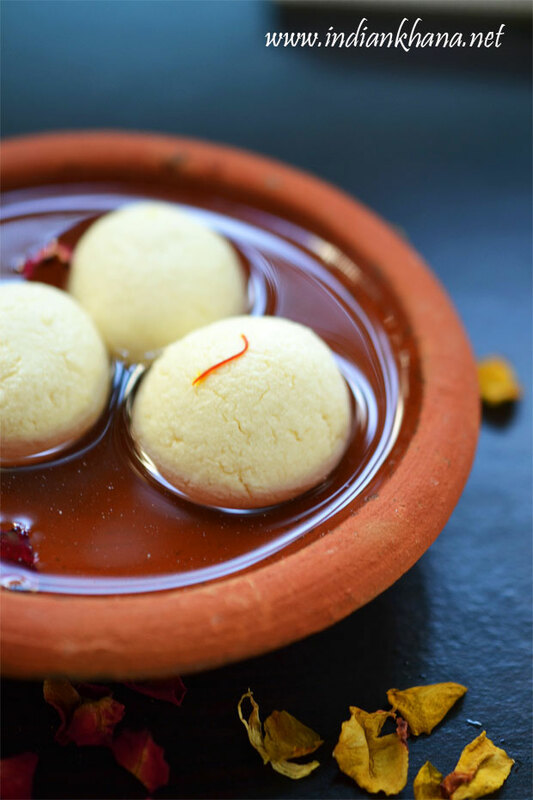 We can also make the rasgulla in pressure cooker, I have written how to do that below so you can either follow the open pan method or pressure cooker one which ever you like. You can check other Sweets Recipes. 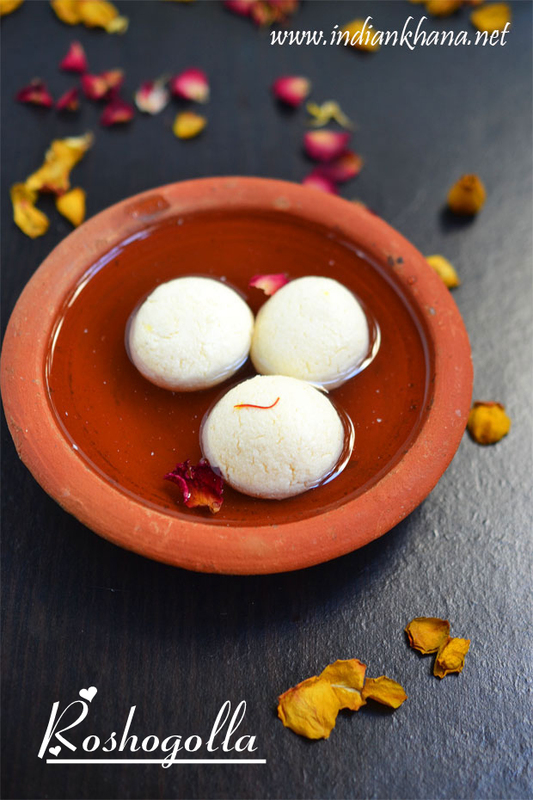 Popular Bengali Sweet Rasgulla or Roshogolla spongy, melt in mouth sweet for any festival. Heat milk and when it starts to boil keep flame to slow to medium and add lemon juice, off flame. Keep stirring to mix milk with lemon juice. Once milk starts to curdle and whey separates, stir for another 30 secs to 1 min. You can also add few ice cubes to stop milk from cooking further which results in hard chenna. Keep a metal strainer lined with muslin or cheese cloth on top of big bowl and pour the curdle milk. Wash chenna in running tap water well to remove lemon sourness, tie the cloth squeezing excess water from chenna well, do this properly to have good chenna and hang it on tap to for 15-20 mins. Once all the water gets drain we will get crumble paneer like in picture, knead chenna with fingers and heels of palm for 5-8 mins or until chenna starts to leave oil/fat, we will be able to roll chenna in to ball without any cracks. Divide the chenna dough into equal size portion we can get 10-15 balls I got this time 11 it depends on milk I guess. Make smooth ball with out any cracks (it's important not to have any crack) without applying too much of pressure. Gently roll them into balls. Before we start to knead the chenna boil water in a large vessel with sugar, cardamom powder. When syrup comes to rolling boil (sugar will be melted by now) add prepared paneer balls gently, cover and cook for 12-15 mins on medium flame, we can uncover and check in intervals (I can't stop myself from doing this). Once cooked rasgulla will be double in size, to check if it's cooked properly drop a piece of rasgulla in drinking water, if it's sinks it's cooked, if it's floats then cook for another 1-2 min and repeat the test. 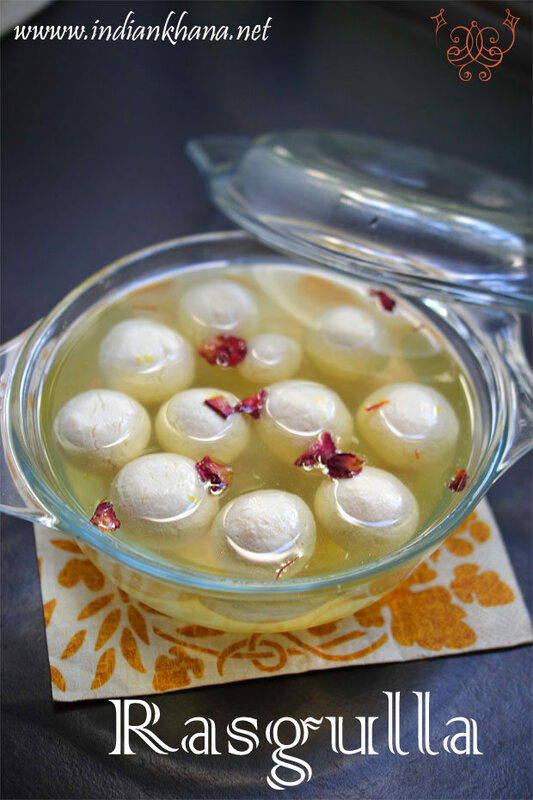 Once all rasgulla cooked, transfer them to in a large bowl with ample of normal water. 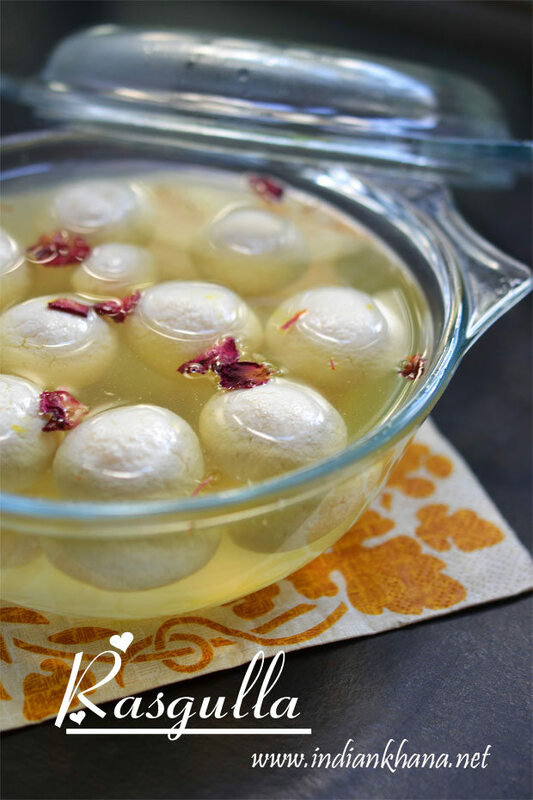 Allow sugar syrup to cool down, once they become warm add saffron, kewra or rose water (if using), when syrup comes to room temperature, take out rasgulla from normal water, squeeze gently and drop in sugar syrup (this is optional but it avoid from rasgulla to go flat) Chill for minimum of 3-4 hours, garnish with nuts before serving. You can also make the syrup in cooker, add paneer balls and cook for 1 whistle in medium flame. Use fresh full cream milk, toned milk doesn't work well for rasgulla. Once you add lemon juice, off flame. Make sure to drain water well from chenna if not either we can roll balls or it will break. If you squeeze very hard chenna then it will give dry chenna resulting in dry rasgulla. Knead the chenna well, have patiences and knead for 6-8 mins or until your hands becomes oil from chenna fat, when rolled in ball there shouldn't be any crack. 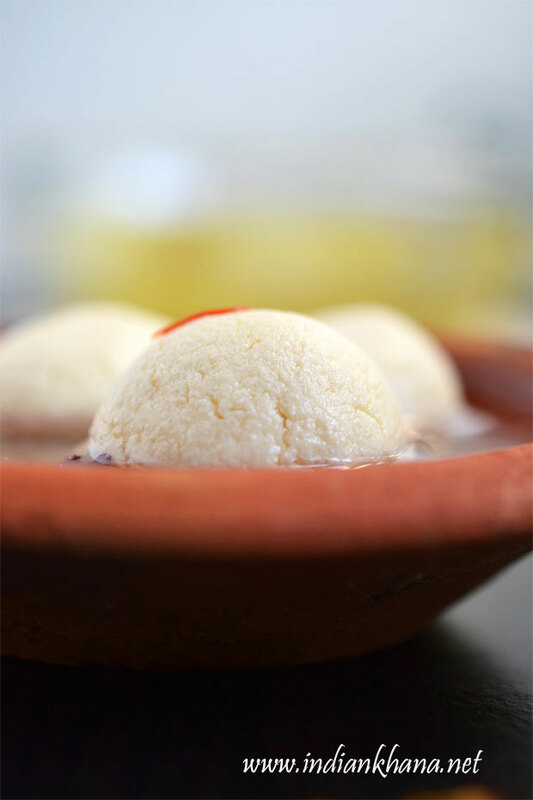 Enjoy the delicious home made rasgulla (roshogolla).